Banana is a staple in this part of the world. A fruit available for all the 12 months of the year. And even most of our festival rituals include giving away fruits and mostly banana and betel leaves. On numerous such occasions where everyone is buying and giving away bananas one tend to go bananas wondering what to do with them. Here is nice way of including them in your food. This one will be relished by even those who normally don’t like banana. The fruit has numerous health benefits ranging from providing vital micro-nutrients, aiding digestion, providing energy, improving mood, strengthen your bones, blood, hair,skin etc. Most people avoid it as it is fattening/high in sugar, a fact they conveniently forget while eating sweets and junk food. 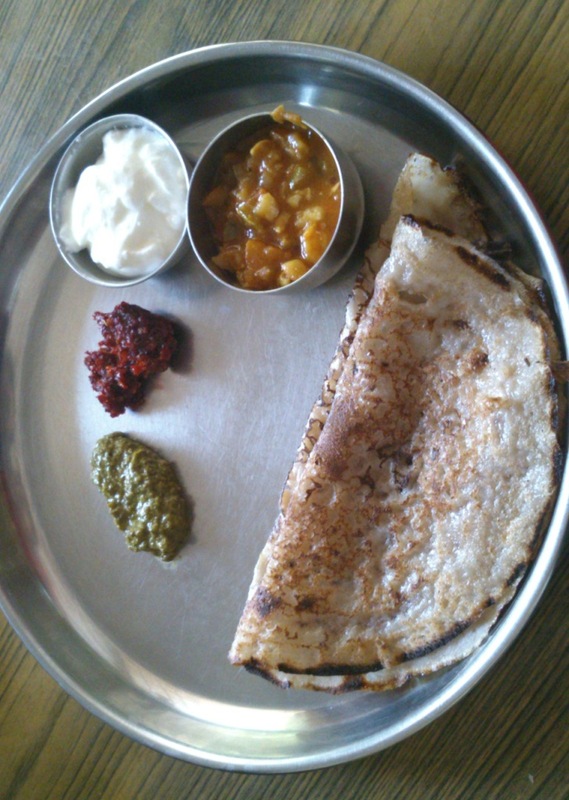 Anyway here is the quick & simple recipe for Banana dosa/ಬಾಳೆಹಣ್ಣು ದೋಸೆ without any more ‘gyan’. 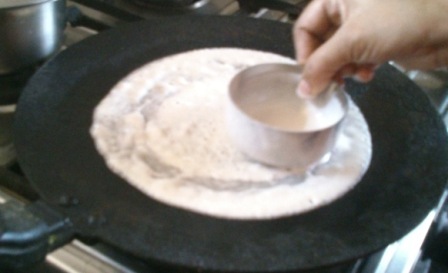 Pour some oil/ghee on a hot flat tawa and spread the batter for delicious dosa. You can have this with any traditional dosa accompaniments or with some yumm sabzi, chutney and curd like we did. That looks yummy you told how to make the dosa but what about the chutney or the sabzi..
🙂 That is why I have this page. Lovely…. We run after banana waffles and panckaes, when we have such traditional recipes in our own country. Thank you for this recipe. Aruna you are absolutely right……… Thanks to sapna for reminding this fact!!!!!! Thanks for the lovely comment Asmithaaa!